Dhaka, 14 Feb, Abnews: BNP leaders and activists are staging a hunger strike in the city demanding release of their party chief Khaleda Zia. Hundreds of BNP men took position in front of the Jatiya Press Club since 10.00am, and the hunger strike will continue till 4.00pm. 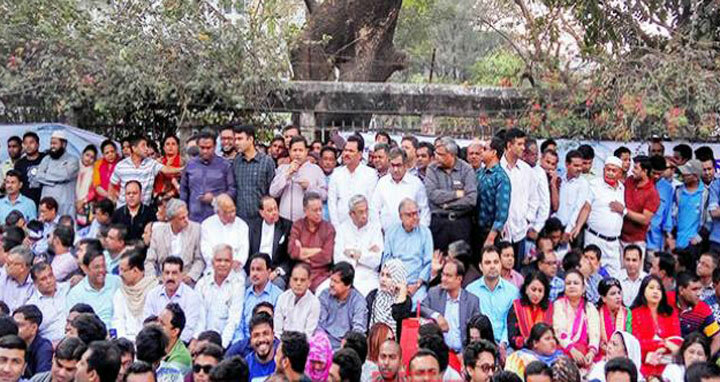 BNP leaders Khandaker Mosharraf Hossain, Moudud Ahmed, Nazrul Islam Khan, Amir Khasru Mahmud Chowdhury, Chowdhury Kamal Ibne Yusuf, Nitai Roy Chowdhury and ZM Jahid Hossain have joined the programme amid tight security by police.